It rained a lot this week. 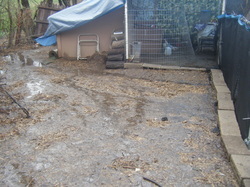 We needed it, but the chicken coop got a lot more rain than it needed. So I've had a busy week cleaning and drying that up, and fixing their ditch so not so much gets to it. The city is also due to start work on the drainage around here within the next few weeks, so I'm hoping this will be the last time. The whole coop was underwater, it's never been this bad. I've also decided to sell my d'uccles. I love them, they are sweet little birds but I'll be happier with just a hen for eye candy than a breeding group of them. I will be attempting to hatch out some olandsk dwarfs soon, and am hoping they give me the pretty colors I like with the milles but without the foot feathers that don't mix well with waterfowl. My seramas will be my free rangers, and I won't have to have any separate pens for them any more, except to separate out pairs for breeding if I want. So the rooster and one of his pullets will be going to a new home this weekend, and so will a few more chickens, ducklings, and goslings. 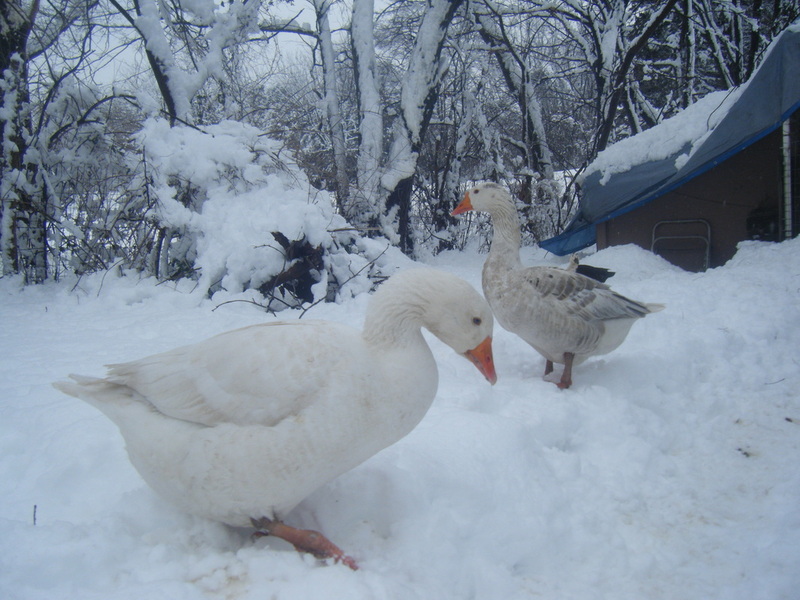 I want to focus mainly on my ducks, and maybe more gamebirds or ornamental birds. I've got chukar in the incubator, I'll see how I like them if I can hatch them. If they don't work out, the next bird I'd like to add will be an ornamental pheasant, probably lady amherst. The first goslings from my pair of geese are hatching. 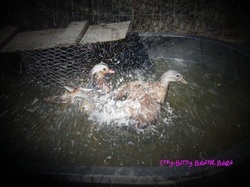 I am crossing my fingers for a cute little gray or pied female gosling. I'll be keeping one, after I lost my other goose I realized I would be better having 3 geese. That way if something happens to one I still have 2, and not a lone goose. 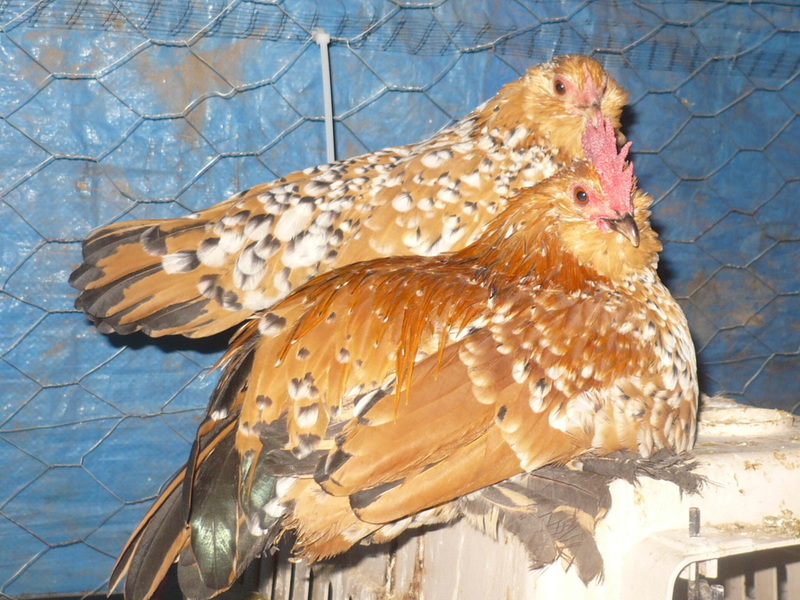 So this fall I am hoping to have 2 serama roosters, 4-5 serama girls, 5-6 assorted "layers". 2 call drakes, 6 call hens, 3 geese, 4 mandarins, and a trio of chukar, and maybe a trio of olandsk dwarfs. Slightly over my "legal" limit I'm allowed still, lol. But enough to keep me happy and not be too crowded, and few enough that I can enjoy them instead of them being work. It just keeps snowing and snowing it seems. Spring is here, but the weather is still acting like winter. I'm pretty tired of it. The birds have got to be tired of it. I hatched my first ducklings of the season. My first babies from my blue magpie. 2 are blue ancona marked babies, the 3rd I don't know yet. I also hatched my first serama babies from my stock, don't have a clue what their colors are going to be of course, lol. I think one looks like it's momma though, black and white mottled. I've got more ducklings and some goslings growing in the incubator, I'd very much like to be able to put them outside soon after hatching. Hoping the weather starts cooperating by then. I've got a new incubator, and now have 2. So that means lots of hatching soon too. And I'm hoping they start laying steady enough soon to start selling eggs too, now that fertility is somewhat checked and babies are growing and hatching. I'll keep checking fertility on new layers and on my birds periodically of course. I plan on having my incubator on through spring. 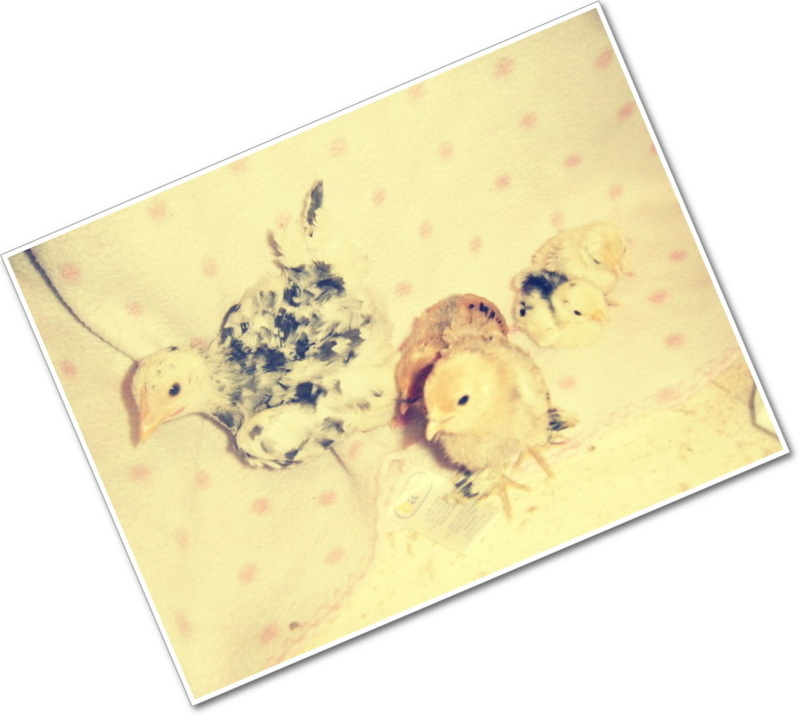 The pic below is 2 of my 10 day old serama and d'uccle chicks, and my teeny little 9 week old japanese bantam pullet. At least I hope it is. But if I say it enough times, maybe it will be true. And it is nice outside, and the snow is melting. Yay! Time to start getting busy out there, so much to do. Gardening, lots of work on the chicken pen to do, mandarin pen, etc. I'm so excited to finally be able to be getting a start on it. I also got a few new additions to the flock yesterday. 3 "cute" little naked neck chicks. They are interesting looking little chicks, hubby and the kids love them, and hopefully there is a girl or 2 out of the 3 that will give me some eggs this fall when my older girls take a break. And I got eggs in the mail yesterday. Some call, crested mallard, and goose eggs from a really sweet person with some pretty pretty ducks. I'm so excited about these! I also set about 10 more serama eggs, and my ONE d'uccle egg that I've gotten. Incubator is full! 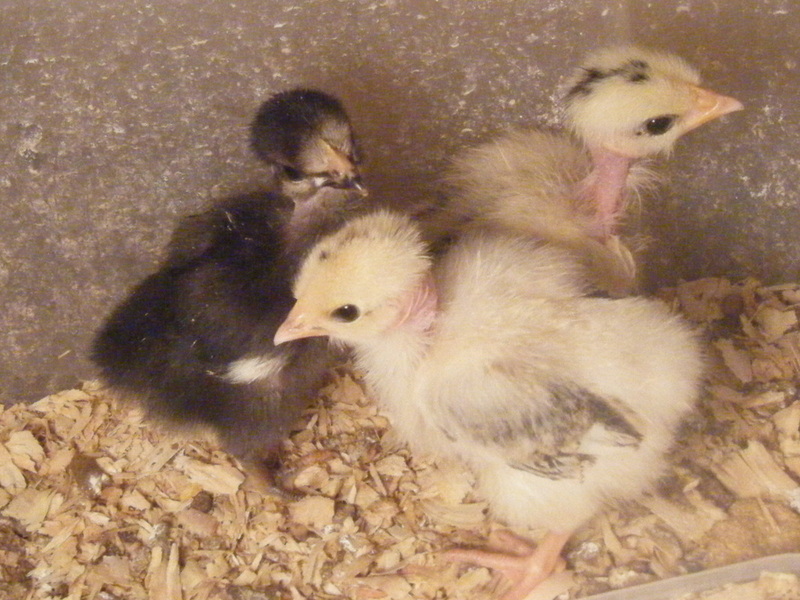 Until next week, when the turkeys and some of the serama hatch, and I have more eggs ready to go in as soon as they do. Time to get to work building myself a "real" incubator, although I have grown to like my little styrofoam lg. I haven't got much done in the last few weeks. It's snowed quite a bit, way too much for my liking. It collapsed the netting over the mandarin pen, I'm just happy it wasn't done yet and empty still. 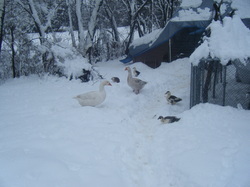 The ducks quit laying since it snowed, and I desperately need to get new netting on the pen the mandarins are in now. I started that today, but it's hard to get much done with frozen fingers and little kids. 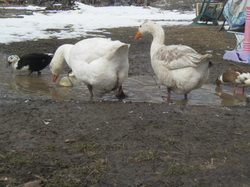 My goose has been laying, and her and the gander have been acting paired off although I haven't seen any breeding. I've set a few of her eggs, I hope to see in a few days if he's been sealing the deal. My serama that was laying went broody and hasn't started back up, but a second pullet is now laying so I'll have those along with the geese eggs hatching for Easter. 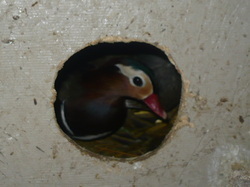 I'm really wanting ducklings though, so I'm hoping the few in the incubator hatch and that mine get to laying soon. And my d'uccles too, lol. I got my first serama eggs about a week ago, and first call duck eggs a few days ago. Actually, I've been keeping everyone locked in the chicken yard each day, and in the pen until noon for the past 3 days and have got an egg each one. So I'm fairly sure there is a clutch in the yard somewhere from when they weren't on lockdown, but I haven't found it yet. I'm so happy to finally have eggs of my own starting to come in. I've just put a few in the incubator, I'm hoping they are fertile. And that more will be on their way. The mandarin's new, bigger pen is getting closer to done. I'm pretty happy with it so far, it doesn't look too terrible for something I've been making by myself, lol. It will be so nice to get it done and feel like I've made a dent in my to-do list at least. Well, it's still winter, and still cold, lol. Bitterly cold, although the forecast for the near future shows some improvement. I'm getting spring fever, and very impatient with not being able to be outside as long as I like getting things done. I've picked up a new dog kennel to use to add on to the mandarin duck pen so they have a bigger area. Then they can have their bigger swimming area and will be much happier I hope. 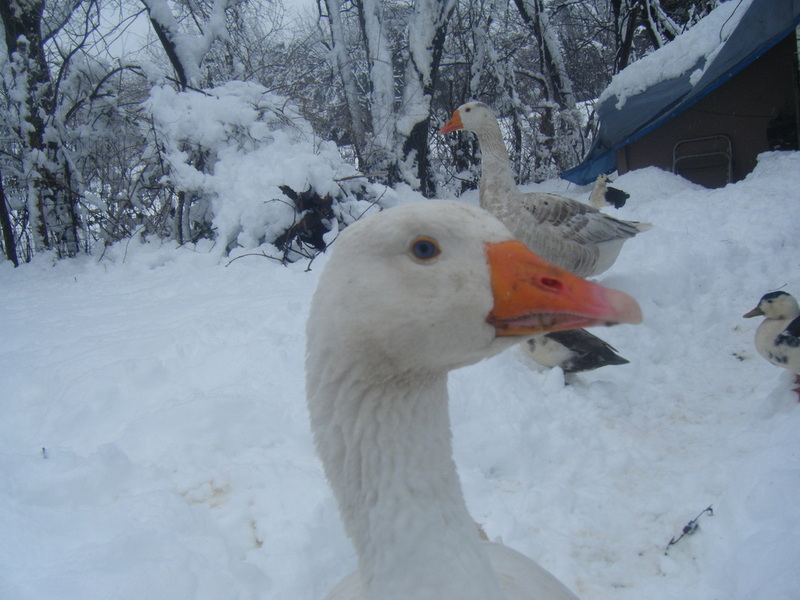 I'm still waiting for eggs from most of my chickens and all of the waterfowl. I may be making some changes to my flock too. I'm more of a waterfowl person than chickens, and somehow I've ended up with more chickens and less waterfowl than I meant, and will be changing that this year. It's hard to decide who stays and who goes though, I wish I could have some of everything, lol. The days are getting longer, and I'm finally finding eggs in my coop again. After going through quite an eggless spell there, I'm thrilled. I have eggs from the japanese bantams in the incubator, and over 2 dozen in the fridge. Yay me! Lol. Now I get to try all the yummy egg recipes I've found, but didn't have enough for. Sure wasn't going to use those nasty store eggs for anything other than cooking, and luckily even during the slow spell my girls squeezed out enough the only store eggs I ended up buying were for holiday baking. Speaking of baking, the ducks are still being slackers. I'm hoping it's only a matter of time there though. They are starting to get frisky, so maybe that's a sign that eggs are on their way. Time flies when you are having fun. It also flies when you aren't. I haven't been able to get anything done lately. It's cold and frozen or cold and muddy outside, of course the holidays have kept me busy, and to top it off I caught the flu at Christmas and just haven't been able to kick it off and get back to normal. My New Year's hatch was a failure, I only ended up with one lone chick. The birds are doing great in spite of me though. The older birds are starting to lay again after molt, and the d'uccles are old enough to be starting soon. 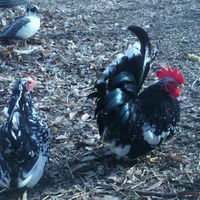 My serama cockerals have started crowing, and have become super friendly. 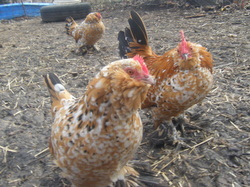 My japanese are doing wonderfully, even my little hen who was a little "off" for quite awhile after the hawk incident. The rooster hasn't shown any signs of frostbite, which I was pretty concerned about having to deal with. I have a half dozen of their eggs in the incubator, and fertility is great on them. I'm hoping with non shipped eggs my next hatch will be much better. 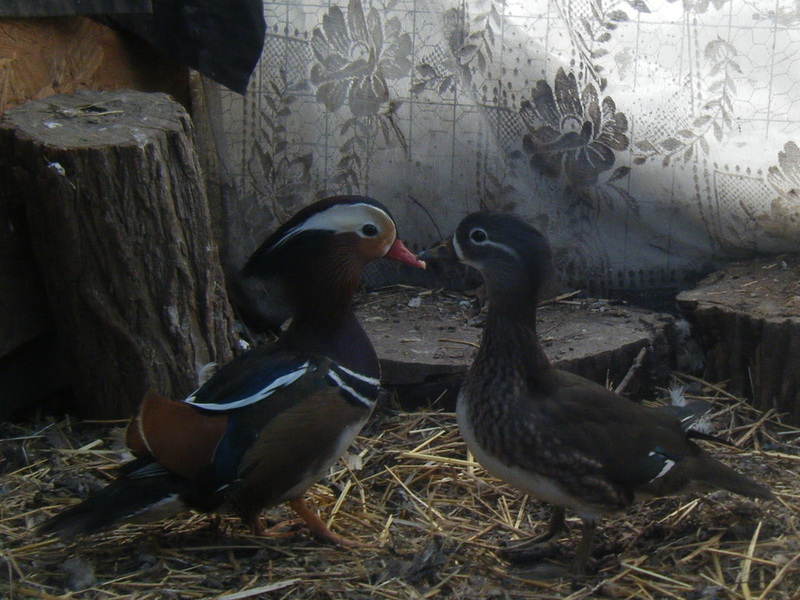 Now I'm just hoping for time to continue to fly so spring can get here, and I can get a move on making the mandarins and d'uccles a bigger pen and pool. Merry Christmas to everyone! This has been a busy month. Christmas, cold weather came in so had to finish up winterizing, had my npip testing, etc. 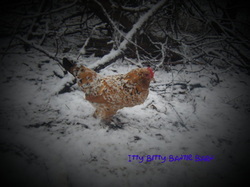 The chickens are starting to pick up laying slowly, even though it's freezing. I've got japanese bantams and 2 duck eggs in the incubator due to hatch around New Years, and if another hen or two starts laying I'll be setting eggs again soon. Once I've hatched out some, and fertility is good I can finally start to sell some. I think I may even ship ducklings and chicks in the spring, and started birds in the fall. If all goes well that is. I hope everyone has a happy holiday. God bless! Hi, I'm the owner of Itty Bitty Bantie Barn. I had originally planned on an information page, but I think the links page should cover most of that when I'm done. So instead I've decided to start a blog in it's place, and hopefully I can cover some information here.